Midstream companies are carrying the team so far this year. 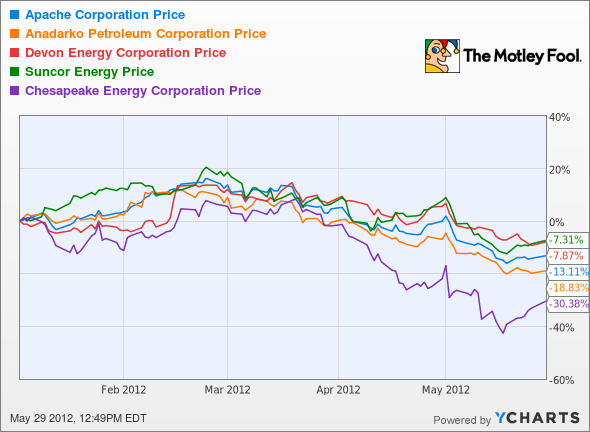 Plenty of energy stocks enjoyed a strong beginning to 2012. 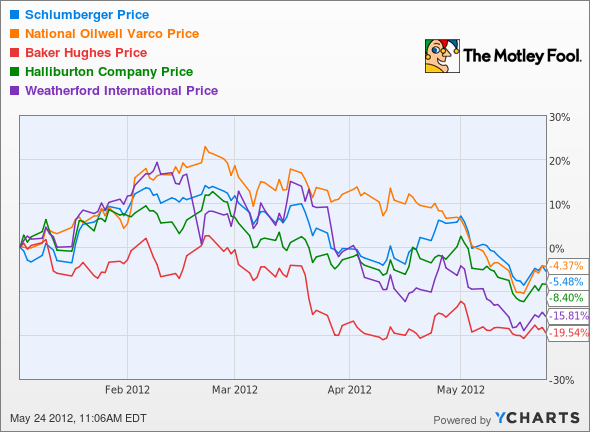 As recently as the end of March, Devon Energy, Marathon Oil, and National Oilwell Varco were all up 19% or more. Energy mutual funds returned 10% in the first quarter, far and away the best sector performance, and well above the average fund return of 3%. But it has been a tough May for the market, and just like most every other sector, energy stocks took a beating. Year to date, we are looking at a much different picture now than two months ago. However, as we break the industry apart, upon closer inspection there is one specific segment of the energy world that continues to thrive. 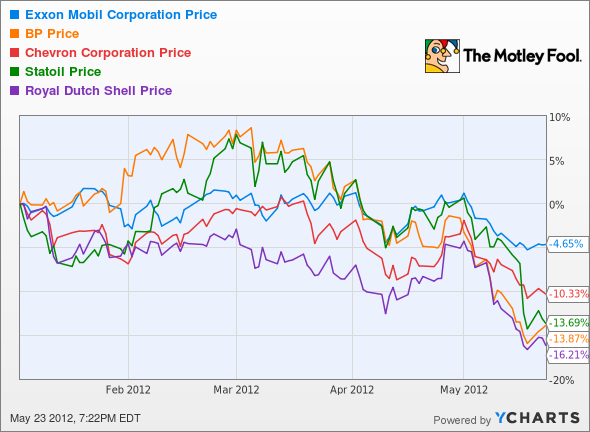 Big oil has been taking it on the chin for the past few weeks. Worries over a collapsing European economy, lower prognostications for China's growth rate, and the lowest oil prices in seven months really crushed the big guns. Last month, Russia announced it was altering its offshore policies and loosening its tax code in an effort to bring in foreign oil companies to explore its Arctic reserves. An estimated 25% of the world's remaining oil supply lies buried under frigid water. While ExxonMobil, Statoil, and Eni are set to explore Russia, Shell has its plan in motion for the freezing waters off Alaska. That being said, there are still plenty of questions remaining about the commercial viability of Arctic offshore drilling. Until they are resolved, don't expect these projects to move the needle on these stocks. Instead, look for a rebound when the price of oil rises again. Independent oil and gas producers tend to be more volatile stocks than majors, so things can get pretty rough when the market drops. Or as is the case with Chesapeake Energy (NYSE: CHK), when your rogue CEO institutes policies that pad his pocket, your board refuses to be accountable to shareholders, and the price of natural gas sinks to lower depths than the aforementioned rogue CEO's reputation, well, things will get pretty rough then, too. Suncor (NYSE: SU) is Canada's largest energy company, and heavily invested in production of the bitumen oil sands. Oil sands companies have had to work hard to reassure the market that rising costs and environmental opposition won't stymie production and profitability. Apache and Devon Energy are definitely stocks to keep an eye on as oil prices bounce back. Devon has made a serious and successful effort to focus production on liquids instead of natural gas. Apache, on the other hand, seems to report great news every other week, and its long-term outlook is strong. As it becomes more necessary to use complicated technologies in exploration and production, oil-field-service companies such as Schlumberger (NYSE: SLB), Weatherford International (NYSE: WFT), and Halliburton (NYSE: HAL) become more or less indispensable. That is, of course, until the price of oil drops and the hard-to-reach oil becomes prohibitively expensive to produce. When oil drops, oil-field-service companies drop as well. Year to date, there are few winners here. But again, as with our majors, when the price of oil climbs, these stocks will rise as well. And if the U.S. price of natural gas ever climbs to a reasonable level again, we can expect another pop then. Our midstream stocks aren't impervious to tough days in the market. In fact, when I looked at this group in the beginning of May, they were all performing much better. That being said, these stocks are still up year to date and comprise the strongest-performing energy subsector right now. There has been plenty of good news in the world of midstream to help keep these stocks afloat: Kinder Morgan closed on its deal to acquire El Paso, and Enterprise Products Partners and Enbridge reversed the flow of their Seaway pipeline. But there is more to the relative success of midstream stocks than just headlines. Midstream stocks hold one advantage over most other energy stocks, and that is that their business models are almost always built around fee-based contracts, and not tied to the price of commodities. It doesn't matter if the oil flowing through a pipeline is worth $1 or $100, it will cost the same to transport it. The pipelines make more money as volumes increase across their systems. Right now, there is plenty of demand to increase North American midstream infrastructure, which means these stocks will remain solid investments for quite some time. 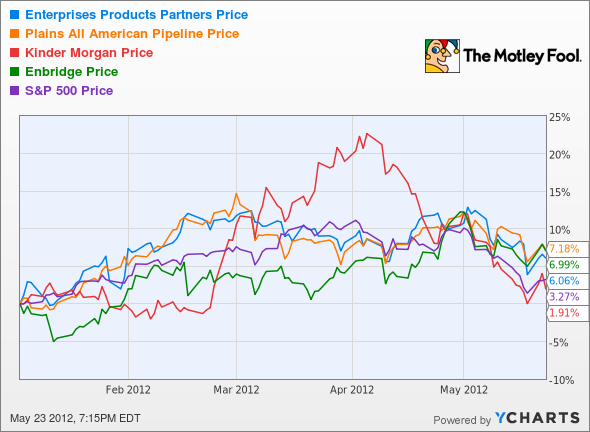 Typically organized as master limited partnerships, midstream stocks also offer great yields. Though there is a little extra paperwork come tax time, yields are often 5% or greater. Generous dividends create long-term wealth, but midstream companies aren't the only great dividend stocks out there. For a look at some other great dividend ideas, check out the Fool's special free report detailing nine rock-solid dividends. Be sure to look over this outstanding report now, it will only be available for a limited time.